Titus Flavius Josephus (/dʒoʊˈsiːfəs/; Greek: Φλάβιος Ἰώσηπος; 37 – c. 100), born Yosef ben Matityahu (Hebrew: יוסף בן מתתיהו, Yosef ben Matityahu; Greek: Ἰώσηπος Ματθίου παῖς), was a first-century Romano-Jewish historian who was born in Jerusalem—then part of Roman Judea—to a father of priestly descent and a mother who claimed royal ancestry. He initially fought against the Romans during the First Jewish–Roman War as head of Jewish forces in Galilee, until surrendering in 67 CE to Roman forces led by Vespasian after the six-week siege of Jotapata. Josephus claimed the Jewish Messianic prophecies that initiated the First Roman-Jewish War made reference to Vespasian becoming Emperor of Rome. In response Vespasian decided to keep Josephus as a slave and presumably interpreter. After Vespasian became Emperor in 69 CE, he granted Josephus his freedom, at which time Josephus assumed the emperor's family name of Flavius. Flavius Josephus fully defected to the Roman side and was granted Roman citizenship. He became an advisor and friend of Vespasian's son Titus, serving as his translator when Titus led the Siege of Jerusalem. Since the siege proved ineffective at stopping the Jewish revolt, the city's destruction and the looting and destruction of Herod's Temple (Second Temple) soon followed. Josephus recorded Jewish history, with special emphasis on the first century CE and the First Jewish–Roman War (66-70 CE), including the Siege of Masada. His most important works were The Jewish War (c. 75) and Antiquities of the Jews (c. 94). The Jewish War recounts the Jewish revolt against Roman occupation. Antiquities of the Jews recounts the history of the world from a Jewish perspective for an ostensibly Greek and Roman audience. These works provide valuable insight into first century Judaism and the background of Early Christianity. (See main article Josephus on Jesus). 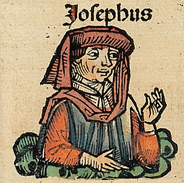 Born into one of Jerusalem's elite families, Josephus introduces himself in Greek as Iōsēpos (Ιώσηπος), son of Matthias, an ethnic Jewish priest. He was the second-born son of Matthias. His older full-blooded brother was also called Matthias. Their mother was an aristocratic woman who descended from the royal and formerly ruling Hasmonean dynasty. Josephus's paternal grandparents were Josephus and his wife—an unnamed Hebrew noblewoman, distant relatives of each other and direct descendants of Simon Psellus. Josephus's family was wealthy. He descended through his father from the priestly order of the Jehoiarib, which was the first of the 24 orders of priests in the Temple in Jerusalem. Josephus was a descendant of the high priest Jonathon. He was raised in Jerusalem and educated alongside his brother. In his early twenties, he traveled to negotiate with Emperor Nero for the release of 12 Jewish priests. Upon his return to Jerusalem, at the outbreak of the First Jewish–Roman War, Josephus was appointed the military governor of Galilee, but eventually he strove with John of Gischala over the control of Galilee, who like Josephus, had amassed to himself a large band of supporters from Gischala (Gush Halab) and Gabara,[a] including the support of the Sanhedrin in Jerusalem. Josephus fortified several towns and villages in Galilee, among which were Tiberias, Bersabe, Selamin and Tarichaea, in anticipation of a Roman onslaught, and resisted the Roman army in its siege of Yodfat (Jotapata) until it fell to the Roman army in the lunar month of Tammuz, in the thirteenth year of Nero's reign. After the Jewish garrison of Yodfat fell under siege, the Romans invaded, killing thousands; the survivors committed suicide. According to Josephus, he was trapped in a cave with 40 of his companions in July 67 CE. The Romans (commanded by Flavius Vespasian and his son Titus, both subsequently Roman emperors) asked the group to surrender, but they refused. Josephus suggested a method of collective suicide; they drew lots and killed each other, one by one, counting to every third person. Two men were left (this method as a mathematical problem is referred to as the Josephus problem, or Roman roulette), who surrendered to the Roman forces and became prisoners. In 69 CE, Josephus was released. According to his account, he acted as a negotiator with the defenders during the Siege of Jerusalem in 70 CE, in which his parents and first wife died. While being confined at Yodfat (Jotapata), Josephus claimed to have experienced a divine revelation that later led to his speech predicting Vespasian would become emperor. After the prediction came true, he was released by Vespasian, who considered his gift of prophecy to be divine. Josephus wrote that his revelation had taught him three things: that God, the creator of the Jewish people, had decided to "punish" them; that "fortune" had been given to the Romans; and that God had chosen him "to announce the things that are to come". To many Jews, such claims were simply self-serving. In 71 CE, he went to Rome in the entourage of Titus, becoming a Roman citizen and client of the ruling Flavian dynasty (hence he is often referred to as Flavius Josephus). In addition to Roman citizenship, he was granted accommodation in conquered Judaea and a pension. While in Rome and under Flavian patronage, Josephus wrote all of his known works. Although he uses "Josephus", he appears to have taken the Roman praenomen Titus and nomen Flavius from his patrons. Vespasian arranged for Josephus to marry a captured Jewish woman, whom he later divorced. About 71 CE, Josephus married an Alexandrian Jewish woman as his third wife. They had three sons, of whom only Flavius Hyrcanus survived childhood. Josephus later divorced his third wife. Around 75 CE, he married his fourth wife, a Greek Jewish woman from Crete, who was a member of a distinguished family. They had a happy married life and two sons, Flavius Justus and Flavius Simonides Agrippa. Josephus's life story remains ambiguous. He was described by Harris in 1985 as a law-observant Jew who believed in the compatibility of Judaism and Graeco-Roman thought, commonly referred to as Hellenistic Judaism. Before the 19th century, the scholar Nitsa Ben-Ari notes that his work was shunned like that of converts, then banned as those of a traitor, whose work was not to be studied or translated into Hebrew. His critics were never satisfied as to why he failed to commit suicide in Galilee, and after his capture, accepted the patronage of Romans. [Josephus] was conceited, not only about his own learning, but also about the opinions held of him as commander both by the Galileans and by the Romans; he was guilty of shocking duplicity at Jotapata, saving himself by sacrifice of his companions; he was too naive to see how he stood condemned out of his own mouth for his conduct, and yet no words were too harsh when he was blackening his opponents; and after landing, however involuntarily, in the Roman camp, he turned his captivity to his own advantage, and benefited for the rest of his days from his change of side. Josephan scholarship in the 19th and early 20th centuries took an interest in Josephus's relationship to the sect of the Pharisees. It consistently portrayed him as a member of the sect and as a traitor to the Jewish nation—a view which became known as the classical concept of Josephus. In the mid-20th century a new generation of scholars[who?] challenged this view and formulated the modern concept of Josephus. They consider him a Pharisee but restore his reputation in part as patriot and a historian of some standing. In his 1991 book, Steve Mason argued that Josephus was not a Pharisee but an orthodox Aristocrat-Priest who became associated with the philosophical school of the Pharisees as a matter of deference, and not by willing association. The works of Josephus include useful material for historians about individuals, groups, customs, and geographical places. Some of these, such as the city of Seron, receive no mention in the surviving texts of any other ancient authority. His writings provide a significant, extra-Biblical account of the post-Exilic period of the Maccabees, the Hasmonean dynasty, and the rise of Herod the Great. He describes the Sadducees, Jewish High Priests of the time, Pharisees and Essenes, the Herodian Temple, Quirinius' census and the Zealots, and to such figures as Pontius Pilate, Herod the Great, Agrippa I and Agrippa II, John the Baptist, James the brother of Jesus, and to Jesus (for more see Josephus on Jesus). Josephus represents an important source for studies of immediate post-Temple Judaism and the context of early Christianity. A careful reading of Josephus's writings and years of excavation allowed Ehud Netzer, an archaeologist from Hebrew University, to discover what he considered to be the location of Herod's Tomb, after a search of 35 years. It was above aqueducts and pools, at a flattened desert site, halfway up the hill to the Herodium, 12 km south of Jerusalem—as described in Josephus's writings. In October 2013, archaeologists Joseph Patrich and Benjamin Arubas challenged the identification of the tomb as that of Herod. According to Patrich and Arubas, the tomb is too modest to be Herod's and has several unlikely features. Roi Porat, who replaced Netzer as excavation leader after the latter's death, stood by the identification. For many years, the works of Josephus were largely known in Europe only in an imperfect Latin translation from the original Greek. Only in 1544 did a version of the standard Greek text become available in French, edited by the Dutch humanist Arnoldus Arlenius. The first English translation, by Thomas Lodge, appeared in 1602, with subsequent editions appearing throughout the 17th century. The 1544 Greek edition formed the basis of the 1732 English translation by William Whiston, which achieved enormous popularity in the English-speaking world. It was often the book—after the Bible—that Christians most frequently owned. A cross-reference apparatus for Whiston's version of Josephus and the biblical canon also exists. Whiston claimed that certain works by Josephus had a similar style to the Epistles of St Paul. Later editions of the Greek text include that of Benedikt Niese, who made a detailed examination of all the available manuscripts, mainly from France and Spain. Henry St. John Thackeray used Niese's version for the Loeb Classical Library edition widely used today. Scholars debate about Josephus's intended audience. For example, Antiquities of the Jews could be written for Jews—"a few scholars from Laqueur onward have suggested that Josephus must have written primarily for fellow-Jews (if also secondarily for Gentiles). The most common motive suggested is repentance: in later life he felt so badly about the traitorous War that he needed to demonstrate … his loyalty to Jewish history, law and culture." However, Josephus's "countless incidental remarks explaining basic Judean language, customs and laws … assume a Gentile audience. He does not expect his first hearers to know anything about the laws or Judean origins." The issue of who would read this multi-volume work is unresolved. Other possible motives for writing Antiquities could be to dispel the misrepresentation of Jewish origins or as an apologetic to Greek cities of the Diaspora in order to protect Jews and to Roman authorities to garner their support for the Jews facing persecution. Neither motive explains why the proposed Gentile audience would read this large body of material. In the Preface to Jewish Wars, Josephus criticizes historians who misrepresent the events of the Jewish–Roman War, writing that "they have a mind to demonstrate the greatness of the Romans, while they still diminish and lessen the actions of the Jews." Josephus states that his intention is to correct this method but that he "will not go to the other extreme … [and] will prosecute the actions of both parties with accuracy." Josephus suggests his method will not be wholly objective by saying he will be unable to contain his lamentations in transcribing these events; to illustrate this will have little effect on his historiography, Josephus suggests, "But if any one be inflexible in his censures of me, let him attribute the facts themselves to the historical part, and the lamentations to the writer himself only." His preface to Antiquities offers his opinion early on, saying, "Upon the whole, a man that will peruse this history, may principally learn from it, that all events succeed well, even to an incredible degree, and the reward of felicity is proposed by God." After inserting this attitude, Josephus contradicts himself: "I shall accurately describe what is contained in our records, in the order of time that belongs to them … without adding any thing to what is therein contained, or taking away any thing therefrom." He notes the difference between history and philosophy by saying, "[T]hose that read my book may wonder how it comes to pass, that my discourse, which promises an account of laws and historical facts, contains so much of philosophy." In both works, Josephus emphasizes that accuracy is crucial to historiography. Louis H. Feldman notes that in Wars, Josephus commits himself to critical historiography, but in Antiquities, Josephus shifts to rhetorical historiography, which was the norm of his time. Feldman notes further that it is significant that Josephus called his later work "Antiquities" (literally, archaeology) rather than history; in the Hellenistic period, archaeology meant either "history from the origins or archaic history." Thus, his title implies a Jewish peoples' history from their origins until the time he wrote. This distinction is significant to Feldman, because "in ancient times, historians were expected to write in chronological order," while "antiquarians wrote in a systematic order, proceeding topically and logically" and included all relevant material for their subject. Antiquarians moved beyond political history to include institutions and religious and private life. Josephus does offer this wider perspective in Antiquities. To compare his historiography with another ancient historian, consider Dionysius of Halicarnassus. Feldman lists these similarities: "Dionysius in praising Rome and Josephus in praising Jews adopt same pattern; both often moralize and psychologize and stress piety and role of divine providence; and the parallels between … Dionysius's account of deaths of Aeneas and Romulus and Josephus's description of the death of Moses are striking." In the wake of the suppression of the Jewish revolt, Josephus would have witnessed the marches of Titus's triumphant legions leading their Jewish captives, and carrying treasures from the despoiled Temple in Jerusalem. It was against this background that Josephus wrote his War, claiming to be countering anti-Judean accounts. He disputes the claim that the Jews served a defeated God and were naturally hostile to Roman civilization. Rather, he blames the Jewish War on what he calls "unrepresentative and over-zealous fanatics" among the Jews, who led the masses away from their traditional aristocratic leaders (like himself), with disastrous results. Josephus also blames some of the Roman governors of Judea, representing them as corrupt and incompetent administrators. According to Josephus, the traditional Jew was, should be, and can be a loyal and peace-loving citizen. Jews can, and historically have, accepted Rome's hegemony precisely because their faith declares that God himself gives empires their power. The next work by Josephus is his twenty-one volume Antiquities of the Jews, completed during the last year of the reign of the Emperor Flavius Domitian, around 93 or 94 CE. In expounding Jewish history, law and custom, he is entering into many philosophical debates current in Rome at that time. Again he offers an apologia for the antiquity and universal significance of the Jewish people. Josephus claims to be writing this history because he "saw that others perverted the truth of those actions in their writings," those writings being the history of the Jews. In terms of some of his sources for the project, Josephus says that he drew from and "interpreted out of the Hebrew Scriptures" and that he was an eyewitness to the wars between the Jews and the Romans, which were earlier recounted in Jewish Wars. Louis H. Feldman outlines the difference between calling this work Antiquities of the Jews instead of History of the Jews. Although Josephus says that he describes the events contained in Antiquities "in the order of time that belongs to them," Feldman argues that Josephus "aimed to organize [his] material systematically rather than chronologically" and had a scope that "ranged far beyond mere political history to political institutions, religious and private life." ^ "Josephus". Collins English Dictionary. HarperCollins Publishers. ^ Douer, Alisa (2015). Egypt - The Lost Homeland: Exodus from Egypt, 1947-1967 - The History of the Jews in Egypt, 1540 BCE to 1967 CE (Arabische Welt - Arab World). Logos Verlag. p. 277, footnote 190. ISBN 3832540520. ^ Josephus refers to himself in his Greek works as Ἰώσηπος Ματθίου παῖς, Iōsēpos Matthiou pais (Josephus the son of Matthias). Josephus spoke Aramaic, Hebrew and Greek. ^ Simon Claude Mimouni, Le Judaïsme ancien du VIe siècle avant notre ère au IIIe siècle de notre ère : Des prêtres aux rabbins, Paris, P.U.F., coll. « Nouvelle Clio », 2012, p. 133. ^ Telushkin, Joseph. "Ancient Jewish History: The Great Revolt". Jewish Virtual Library. ^ a b c Harris 1985. ^ Mason 2000, p. 12–13. ^ Nodet 1997, p. 250. ^ "JOSEPHUS LINEAGE" (PDF). History of the Daughters (Fourth ed.). Sonoma, California: L P Publishing. December 2012. pp. 349–350. ^ a b Schürer 1973, p. 45–46. ^ Mason 2000, p. 13. ^ Goldberg, G. J. "The Life of Flavius Josephus". Josephus.org. Retrieved 2012-05-18. ^ Klausner, J. (1934). "Qobetz". Journal of the Jewish Palestinian Exploration Society (in Hebrew). 3: 261–263. ^ Rappaport, Uriel (2013). John of Gischala, from the mountains of Galilee to the walls of Jerusalem. p. 44 [note 2]. ^ Safrai, Ze'ev (1985). 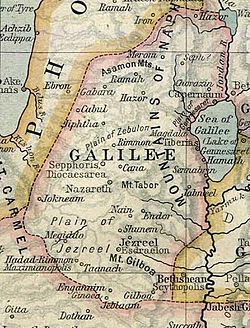 The Galilee in the time of the Mishna and Talmud (in Hebrew) (2nd ed.). Jerusalem. pp. 59–62. ^ Gray 1993, p. 35–38. ^ Aune 1991, p. 140. ^ Gnuse 1996, p. 136–142. ^ Attested by the third-century Church theologian Origen (Comm. Matt. 10.17). ^ Ben-Ari, Nitsa (2003). "The double conversion of Ben-Hur: a case of manipulative translation" (PDF). Target. 14 (2): 263–301. Retrieved 28 November 2011. The converts themselves were banned from society as outcasts and so was their historiographic work or, in the more popular historical novels, their literary counterparts. 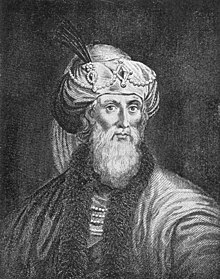 Josephus Flavius, formerly Yosef Ben Matityahu (34-95), had been shunned, then banned as a traitor. ^ Josephus, Flavius (1981). The Jewish War. Translated by Williamson, G. A. Introduction by E. Mary Smallwood. New York: Penguin. p. 24. ^ Raymond 2010, p. 222. ^ Millard 1997, p. 306. ^ Mason, Steve (April 2003). "Flavius Josephus and the Pharisees". The Bible and Interpretation. Retrieved 2012-05-18. ^ Kraft, Dina (May 9, 2007). "Archaeologist Says Remnants of King Herod's Tomb Are Found". NY Times. Retrieved 24 September 2015. ^ Murphy 2008, p. 99. ^ a b c Hasson, Nir (October 11, 2013). "Archaeological stunner: Not Herod's Tomb after all?". Haaretz. Archived from the original on 27 September 2015. Retrieved 24 September 2015. ^ Clontz, T.; Clontz, J. (2008). The Comprehensive New Testament. Cornerstone Publications. ISBN 978-0-9778737-1-5. ^ Bennett, Rick (November 30, 2011). "New Release: Comprehensive Crossreferences". Accordancebible.com. Retrieved 2012-05-18. ^ Maier 1999, p. 1070. ^ Bowman 1987, p. 373. ^ Mason 1998, p. 66. ^ Mason 1998, p. 67. ^ Mason 1998, p. 68. ^ Mason 1998, p. 70. ^ a b JW preface. 4. ^ a b c Ant. preface. 3. ^ Feldman 1998, p. 9. ^ a b Feldman 1998, p. 10. ^ a b c Feldman 1998, p. 13. ^ Ehrman 1999, p. 848–849. ^ a b Ant. preface. 1. ^ Feldman 1998, p. 232. ^ A large village in Galilee during the 1st century CE., located to the north of Nazareth. In antiquity, the town was called "Garaba", but in Josephus' historical works of antiquity, the town is mentioned by its Greek corruption, "Gabara". Aune, David Edward (1991) [first published 1983]. Prophecy In Early Christianity and the Ancient Mediterranean World. William B. Eerdmans Publishing Company. ISBN 0-8028-0635-X. Bowman, Steven (1987). "Josephus in Byzantium". In Feldman, Louis H.; Hata, Gōhei (eds.). Josephus, Judaism and Christianity. Wayne State University Press. ISBN 90-04-08554-8. Ehrman, Bart D. (1999). Jesus: Apocalyptic Prophet of the New Millennium (Kindle ed.). Feldman, Louis H. (1998). Josephus's Interpretation of the Bible. Berkeley: University of California Press. Gnuse, Robert Karl (1996). Dreams & Dream Reports in the Writings of Josephus: A Traditio-Historical Analysis. E. J. Brill. ISBN 90-04-10616-2. Gray, Rebecca (1993). Prophetic Figures in Late Second Temple Jewish Palestine: The Evidence from Josephus. Oxford University Press. ISBN 0-19-507615-X. Maier, Paul L., ed. (1999). "Appendix: Dissertation 6 (by Whiston)". The New Complete Works of Josephus. Kregel Academic. ISBN 978-0-8254-9692-9. Retrieved 2013-05-07. Mason, Steve, ed. (1998). "Should Any Wish to Enquire Further (Ant. 1.25): The Aim and Audience of Josephus's Judean Antiquities/Life". Understanding Josephus: Seven Perspectives. Sheffield: Sheffield Academic Press. Mason, Steve, ed. (2000). Flavius Josephus: Translation and Commentary (10 vols. in 12 ed.). Leiden: BRILL. Millard, Alan Ralph (1997). Discoveries From Bible Times: Archaeological Treasures Throw Light on The Bible. Lion Publishing. ISBN 0-7459-3740-3. Murphy, Catherine M. (2008). The Historical Jesus For Dummies. Wiley Publishing, Inc. ISBN 978-0-470-16785-4. Nodet, Etienne (1997). A Search for the Origins of Judaism: From Joshua to the Mishnah. Continuum International Publishing Group. Raymond, Joseph (2010). Herodian Messiah: Case For Jesus As Grandson of Herod. Tower Grover Publishing. Schürer, Emil (1973) . Vermes, Géza; Millar, Fergus; Black, Matthew (eds.). The History of the Jewish People in the Age of Jesus Christ (175 B.C. - A.D. 135). Continuum International Publishing Group. Hillar, Marian (2005). "Flavius Josephus and His Testimony Concerning the Historical Jesus". Essays in the Philosophy of Humanism. Washington, DC: American Humanist Association. 13: 66–103. O'Rourke, P. J. (1993). "The 2000 Year Old Middle East Policy Expert". Give War A Chance. Vintage. Pastor, Jack; Stern, Pnina; Mor, Menahem, eds. (2011). Flavius Josephus: Interpretation and History. Leiden: Brill. ISBN 978-90-04-19126-6. ISSN 1384-2161. Making History: Josephus and Historical Method, edited by Zuleika Rodgers (Boston: Brill, 2007). Josephus, the Emperors, and the City of Rome: From Hostage to Historian, by William den Hollander (Boston: Brill, 2014). Josephus, the Bible, and History, edited by Louis H. Feldman and Gohei Hata (Detroit: Wayne State University Press, 1988). Josephus: The Man and the Historian, by H. St. John Thackeray (New York: Ktav Publishing House, 1967). A Jew Among Romans: The Life and Legacy of Flavius Josephus, by Frederic Raphael (New York: Pantheon Books, 2013). A Companion to Josephus, edited by Honora Chapman and Zuleika Rodgers (Oxford, 2016).